Calling Mega Man! Calling Mega Man! Come in please! Mega Man, we need you! We're down to the wire on our-peace-keeping project. We've got to get those last energy crystals or we can't finish it. Dr. Wily is here now, too... Yes... he's finally found his sanity. He knows where the crystals are! They're in the mining worlds, but we can't get to 'em. The robots are running amok and they're destroying everything! Mega Man, get to those mining worlds pronto! Grab the crystals and stop whoever's in charge. He's one lunatic guy! This is Dr. Light. Over and out! --From the NES Mega Man 3 instruction manual. Well, they finally made up. Dr. Light and Dr. Wily are together again and working on a massive peace-keeping robot named Gamma. Oh, how wonderful that the bad guy is finally good; or is he? When the eight Robot Masters that were designed for good go haywire and steal the power crystals that power Gamma, Dr. Light calls Mega Man back on the scene. This time Mega Man has a new friend, a robotic dog named Rush. Also, Protoman, Dr. Light's first creation, came out of hiding, and nobody knows whose side he is on. Mega Man 3 is almost identical to Mega Man 2 in terms of graphics, sound, and gameplay. That, however, doesn't make this game any less compelling. This game is every bit as classic as its two predecessors, with a few new additions. This game is fun and worth playing. 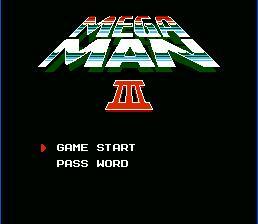 Mega Man 3 is the third installment of the Mega Man Classics (obviously). Just like Mega Man 2, you run around eight stages fighting lesser robots and collecting power-ups that boost health and energy, before facing off with the Robot Master and absorbing his power. In this game, however, you gain the help of a robotic dog named Rush that will morph his body into a sub or a jet to help you. Rush can also change into a coil that will help you jump higher. Fight through the stages and destroy the robot masters which are as follows: Needle Man, Magnet Man, Gemini Man, Hard Man, Top Man, Snake Man, Spark Man, and Shadow Man. As always, you will absorb the defeated boss's powers, and you can then equip his special weapon from the Menu. Throughout the stages, Protoman will appear and fight you for a brief time before taking off. After defeating all the Robot Masters, you are taken to Wily Fortress (I knew he was still the bad guy). Once there, you will have to fight other Robots such as Kamegoro Maker, Yellow Devil MKII, a clone of Mega Man, and all eight robots from Mega Man 2 make a reappearance in Wily Fortress. After defeating all these robots, you are faced with Dr. Wily himself (or so you think). In truth it is only a robot of him. After defeating HIM you are then faced with Gamma, which is controlled by Dr. Wily. So good luck Player, and Lock and Load! Press 'right' on controller 2 and Mega Man can jump much higher and walk across the bottom of pits. For invincibility, have Mega Man jump into a pit, then press 'right' on controller 2. Wait for the energy bar to go black and jump out of the pit. Mega Man will be invincible as long as he does not obtain any energy. Once invincible, the arm cannon no longer works but weapons obtained from bosses do.